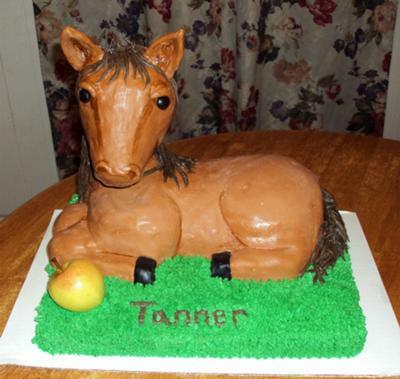 This horse cake was made for a boys birthday. It was definitely a challenge, but was worth it in the end. Cakes used: TWO 12"x18"x2" sheet cakes. An additional sheet cake was baked using a thicker pan to be used for the legs and neck of the horse. I don't remember the pan size. It was basically just an extra cake, because I wasn't sure how many we'd need. Before decorating the cake: marshmallow fondant was home-made, colored with gel colorings of my choice and stored in zip bags until ready to use. A double batch of home-made butter cream icing was also made and set aside in a large container with a lid. The base cake was a 12"x18"x2" sheet cake. The horse's body was made using the second 12"x18"x2" sheet cake which was cut lengthwise and "glued" together with home-made butter cream icing. You cut this cake according to how long and wide you want your horse to be. They were then placed and again "glued" with icing onto the back side of the base cake. The base cake was crumb coated on the top only where the horse was not sitting. You can coat it all if you want to. The butter cream icing was allowed to crust. While waiting, I colored white store bought gum past brown for the ears, shaped them, inserted tooth picks in the bottom, and when dried, covered them in marshmallow fondant. Once the base cake's icing had crusted,the body of the horse was carved using a figurine as a guide. The legs were carved using pieces of cake from the third cake, along with a piece for the neck and then were attached again, using icing as a "glue". The entire horse body and legs were then crumb coated and allowed to crust while the brown marshmallow fondant was being rolled out for the body. The fondant was placed over the body and legs only of the horse (not onto the base cake), and was smoothed by hand into the creases and carved lines. Black fondant was cut to shape and added to the ends of the legs for the hooves. The molded horse head made of rice krispy treats proved to be a cake makers enemy as it was too heavy and did not like being skewered with a dowel rod. The head slowly sank and cracked. I decided to used aluminum foil! I wanted it all to be edible, but at last gave in due to time restraints. Aluminum foil was crumpled, packed, beaten, molded around a thick dowel rod, iced with a thick coat of butter cream and finally covered in the marshmallow fondant. The ears were attached using tooth picks which were pushed into the aluminum head. The head was then attached to the body. The creases, lines and face were accented using brown gel with just a touch of water. The eyes, mane and tail were made with marshmallow fondant rolled and shaped accordingly. The base cake was iced using green colored butter cream and a star tip for the grass. The horse was then brushed with just a little bit of water to take away the dusty look from the powdered sugar that was used in the fondant. You can also use light steam from a clothes iron. At last a small green apple with just a smidge of red on it was added. This cake was heavy and the head did move just a bit. It was boxed with 2 cake boards underneath for support. The box was taped open WELL. Clear plastic wrap was used cover the opening. It did travel to it's destination well, but slowly and the child loved it! Next attempt: a deer for his brother!! Oh my!! Antlers!! Your cake is amazing. It is very talented. I wish you the best of success. Thanks You. My sister in law helped a great deal!! This cake is awesome.You did a great job! Return to September 2011 Cake Decorating Contest Submission Form.